Inspired by the durable Stainless Steel Kite Buggy as our foundation, our Basic and Deluxe TrikeBuggy configurations are solid as a rock and remarkably affordable compared to other PPG trikes. 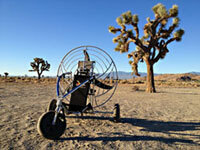 "I saw motors mounted to the kite buggy frame using the PPG harness, but it seemed like they were sitting in a high-chair just ready to topple over. When launching, the wing picks you up by the harness, carrying the motor and finally, the trike along with it - changing and destabilizing the whole balance of the aircraft when going from taxi to flight. I knew there had to be a better way. After much testing, I have found the answer! Take a look at some of the videos in the gallery and you'll see what I mean." "Hi guys, I am in need of some serious engineering help. I just bought a quad and set it up with an Airfer Bimax. When I take off the front wheels are heavy and fall away from my feet. The angle of attack and seating comfort are completely out of whack. If I hook my boot into the front yoke and raise it up a foot to 18 inches it is where it needs to be. The question is, as a seat of the pants engineer, I don't see any way to change this without somehow running a connection from the front end to the harness or the J bar connection. Changing the hang point on the J bars won't cut it. Anyone else have this kind of problem? Am I missing something? Any ideas? Thanks." The center of gravity of the TrikeBuggy is lower than any other PPG Trike, and the wing lifts the trike and pilot together, giving this little flying machine a feel that is more solid than larger, bulkier trikes. With the TrikeBuggy, you simply sit down in the seat of the buggy, fasten your seat belt and go fly! The seated position is so much more comfortable than a traditional PPG harness, and your legs can rest on the footpegs or simply dangle once you have launched. 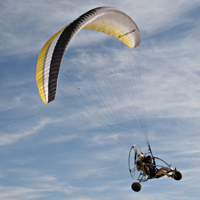 Using our own specially hardware to attach most any paramotor securely to the kite buggy frame, the TrikeBuggy allows a solo powered paraglider pilot to launch easily when there is no wind - the most challenging PPG launch condition. You'll actually smile when the other pilots worry about whether they can pull off a no-wind launch (not to mention the landing!) when the air is smooth and sweet, knowing that you can taxi along after inflation and roll right into a controlled launch. Come into your landing at full speed, with just a nice flare to round out the approach, and roll into a superb touch-down! The Basic TrikeBuggy has a shorter wheelbase and a narrow back axle. TrikeBuggy Deluxe is about 14 inches longer and wider than the Basic and about 10 lbs heavier. 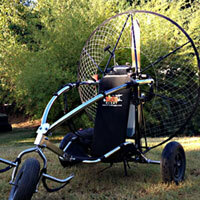 The TrikeBuggy Basic is recommended for expert PPG Trike pilots only, due to its narrower, shorter wheelbase. TrikeBuggy Deluxe has ample room and comfort for larger or heavier pilots, someone that wants a more reclining seated position or students learning to trike. 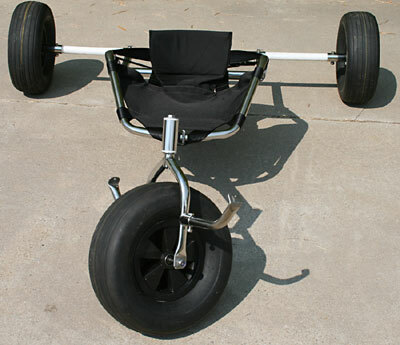 The wide wheelbase makes the Deluxe TrikeBuggy very stable when on the ground, plus when launching and landing. All models include 6" wide wheels (narrow wheels available if desired, no price difference), plus all the hardware to attach most any paramotor, a quick release seat belt, plus our new 30" tall TrikeBuggy embroidered Back Pad and the "Slider" axles. Click any of the pictures on this page for enlargements or go to the TrikeBuggy Gallery for more videos and pictures! Round profile 6" wide tires. "Slider" axles for easy loading and transport. Curved footrests for better foot positioning. Adjustable downtube to accommodate for height. Wrap around seat for lateral stability and back support. Stainless Steel hardware with locking nuts. Strong heavy gauge Stainless Steel tube construction.